Have you ever called a plumbing company, only to have them provide you with instructions on how to fix the problem yourself? Or, have you ever had plumbers show up to your business or residence, only to leave within a few minutes? Some things are easy to fix, while other tasks are not. Here are 5 things plumbers wish everybody knew about plumbing. Just because the object seems to fit in the toilet, does not mean that it belongs in there. Anything that is not naturally produced by the human body or toilet paper can be the worst thing you can do for your pipes. Anything else that supposedly breaks down in the drain can actually cause a buildup of debris and can generate a clog. This will drastically compromise the integrity of your plumbing system and can create a nightmare for plumbers. Pouring cooking oil and grease down your kitchen sink is damaging to the plumbing system. Grease cools and coagulates, becoming very solid and difficult to remove, which can cause slow drains and clogs that are expensive to remove for plumbers compared to clogs caused by other debris. Boiling water won’t remove it and will actually add to the problem in some circumstances. Store your used grease elsewhere or throw it away after wiping it off your pans with a paper towel. Wipes are often advertised as “flushable,” which sounds great, right? Unfortunately, this isn’t true as the material doesn’t break down quickly enough to be truly flushable. Public waste departments spend millions of dollars per year removing objects that won’t break down naturally or at water treatment centers, and that’s just the stuff that makes it that far! Wipes can get caught in your pipes and put undue pressure on your pipes, which can cause breaks and leaks that create unwanted messes. This will also lead to unexpected and expensive repairs from plumbers. 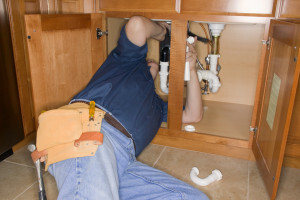 Plumbing is a large system within a business or residence. Systems tend to run better when there is a regular, predictable usage. Overloading any system can cause damage and strain to your plumbing. If you’re planning a significant influx of visitors to your home and predict heavier plumbing usage, it is a good idea to schedule a checkup with plumbers to help keep things flowing during your guests’ visit. A simple checkup can detect early problems which can help to minimize the cost of repairs in the future. If something seems odd about your plumbing system, call the local plumbers. Do not wait until water starts spraying around to pick up the phone. There are telltale signs of plumbing problems that tend to give you an early warning of further issues on the horizon. Do not put off a visit from the plumber to assess the health of your plumbing. The goal of plumbers is to detect problems early to help prevent expensive repairs and emergency situations.